With modern technology, there are lots of ways you can now deliver training courses to your team. This includes taking the traditional approach of classroom-based training, or you can use e-learning solutions. There are different types of e-learning, however, including mobile learning. For the right topic and learner, mobile learning is the ideal choice for your training course. Mobile learning involves creating e-learning courses that learners complete on their phones and/or tablet devices. This differs from an e-learning course primarily designed to be completed on a computer. What about responsive e-learning design, however? Responsive design involves designing an e-learning course so learners can complete it on any device, i.e. computer, phone, or tablet. In other words, the on-screen display adapts to whatever type of device the learner uses. Some of the features and functionality can adapt too. In reality, many professional e-learning developers in Dubai will create mobile learning courses using responsive technology, although it is possible to design for mobile only. The approach you take, however, is arguably more important than your developer’s technical solution. In other words, mobile learning is about not only designing the course for mobile, but also presenting the course to your staff as training they should complete on their phones. What Are the Benefits of the Mobile Learning Approach? Learners can complete courses anywhere and at any time. All learners need is their phone, which many people keep with them most of the time, and an internet connection. If learners will not always have internet access, it is possible to design courses so people can complete them offline. As learners can complete courses on their phone, there is no need for staff to travel for training courses. This saves you money and time. Mobile learning is ideal for non-desk-bound employees who are not regularly at a computer or who travel a lot. This type of employee can often find it difficult to complete an e-learning course that is designed for use on a computer. 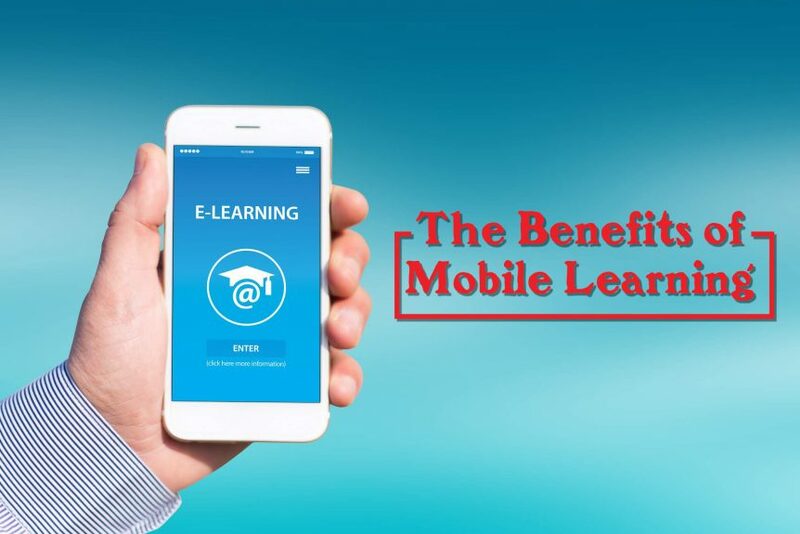 Mobile learning gives learners lots of flexibility over their learning experience, not least because the course is always available on a device they almost always carry. So, rather than having to make time to complete the course in a way that interrupts their day, they can do it whenever the time is right. Delivering training courses on mobile devices is appealing to learners, particularly younger learners. Some of the reasons for this are touched on above, plus there is the fact that most people are comfortable and competent using their phones. This reduces reluctance to learn because of fear of technology. Mobile e-learning courses support all types of media and e-learning features, so you don’t have to compromise on the content. In fact, many elements will work better on mobile than on a desktop computer. A good example is gamification elements. Mobile learning is great for microlearning too, an approach to e-learning that delivers information to learners in bitesize chunks. Creating a mobile learning course is also ideal if you want to make your course as personalised and learner-centric as possible. It is easy to distribute mobile learning courses too. In many cases, this is simply achieved by sending a download to learners’ phones or sending them a link to a website. Mobile learning courses also benefit from multi-device support. In other words, it doesn’t matter what brand of phone the learner uses, and it doesn’t matter if they are on iOS or Android, as the course will still work. A result of many of the points above is that your course will achieve better completion rates. You should also find that retention rates increase too. This applies in the long term as well as the short term as there is the possibility that learners can refer back to a mobile learning course long after they complete it, providing it remains on their phone. Finally, mobile learning encourages social sharing and collaboration. After all, most social media interactions take place on phones. Risk of distracted learning – many people multitask when on their phones. For example, they watch TV while browsing social media or they send messages on their phone while in conversation with someone in person. When learners multitask while completing a mobile learning course, the result is distracted learning. Often this means reduced levels of understanding and lower retention rates. Pressure to complete outside normal working hours – your team might also feel under pressure to complete the e-learning course outside normal working hours because you give it to them on their phone, particularly if it is their personal phone. To combat this, you should assist learners in finding time to complete the course during their normal hours of work. Your e-learning developer will be able to help you make the decision on whether to take a mobile learning approach to your next course. In the right situations, though, the benefits are too important to ignore.